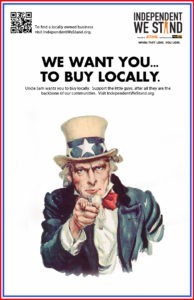 Home » Blog » This Fourth of July We Want You – To Buy Local! From sea to shining sea, independent businesses keep our cities vibrant, heterogeneous, and economically viable. As we celebrate the values of freedom and independence that make this nation great, we mustn’t forget to celebrate the independent business owners who live out American ideals everyday by working hard, doing what they love, and serving their communities. 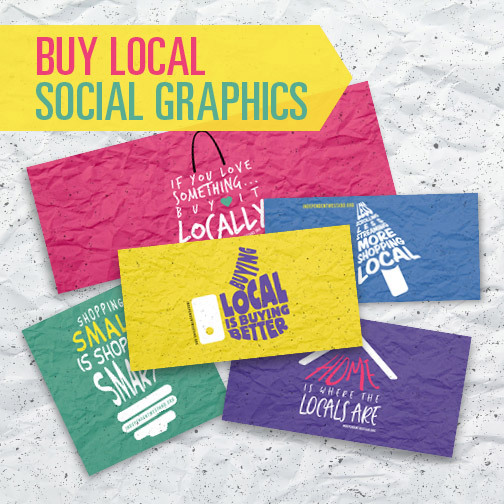 Fourth of July is the perfect time to support your community’s local businesses. 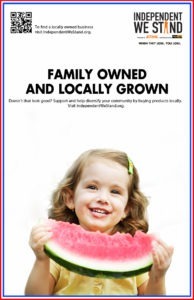 Local farmer’s markets have the freshest produce to serve at your Independence Day cookout, and local garden centers have the ultimate patriotic decorations for your home and lawn. 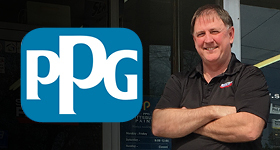 Try our local business search engine to find all kinds of indie businesses in your area, and get ready to make this Independence Day independently owned! 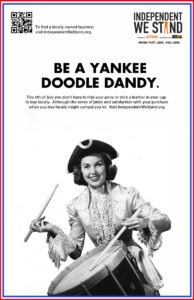 Please help us spread the word by sharing our July Fourth posters. Just click on the posters below to download a high res printable pdf. To share on Facebook, blogs or email blasts, please right click on the poster images below and select “View Image” and then “Save Image As” and save to your hard drive. Read more about buy local materials, buying local, dine indie, eat local, farmers markets, find a local business, find local businesses, find locally owned businesses, get local, Help small business, local business, local businesses, local buying, local shop, shop local, shop locally, Shop Small, shops local, small business, small business help, small businesses, support local farmers, why buy local.